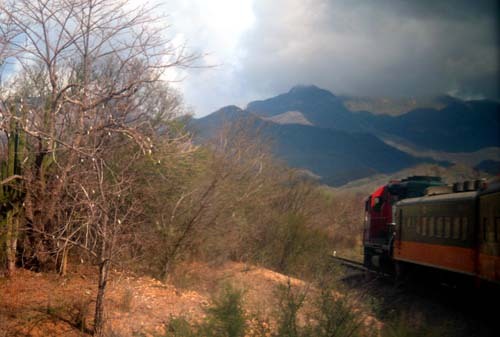 The next morning, from the town of EL FUERTE, we continued on our journey by train. The five-hour train ride brought us to the rim of Copper Canyon. Because of a train robbery and murder, a few years ago, an unobtrusive armed guard rode along in each coach. We passed through rugged country as we chugged along uphill on the narrow track, crossing many bridges and passing through many tunnels.